Thursday, May 3, 2007 in the Air Force One Pavilion at the Ronald Reagan Presidential Library in Simi Valley, CA from 5:00 - 6:30 p.m. Pacific Daylight Time. Sponsors: The Reagan Library Foundation, MSNBC and THE POLITICO. Candidates: All 10 of the major candidates at Mrs. Ronald Reagan’s invitation. 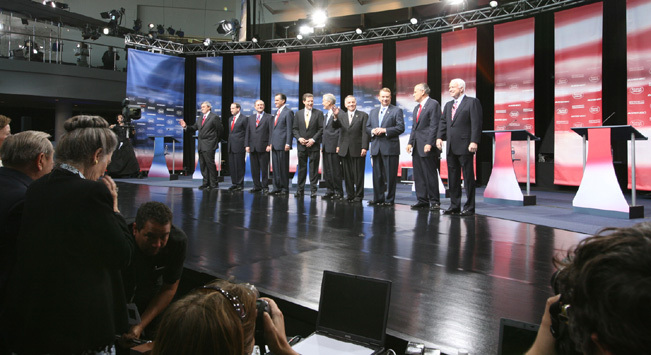 Candidates' positions on the stage were determined randomly. L to R, former Gov. Mitt Romney, Sen. Sam Brownback, former Gov. Jim Gilmore, former Gov. Mike Huckabee, Rep. Duncan Hunter, former Gov. Tommy Thompson, Sen. John McCain, Rep. Ron Paul, former Mayor Rudy Giuliani, Rep. Tom Tancredo. Moderator: Chris Matthews, host of MSNBC's "Hardball." John Harris, THE POLITICO's editor in chief, also asked questions. THE POLITICO's executive editor Jim VandeHei posed questions submitted and voted on by viewers at THE POLITICO website to individual candidates. Audience: There was an audience, but tickets were not made available to the general public. Broadcast: Aired exclusively on MSNBC cable, with full coverage on www.MSNBC.com. THE POLITICO streamed the debate live on www.politico.com. Format: 90 minutes with no commercial breaks. No opening or closing statements. Candidates had one minute to respond to questions; 30 seconds if a rebuttal was necessary. For questions from viewers, candidates had 30 seconds to respond and 30 seconds for rebuttals if necessary. Candidates were asked to refrain from asking questions of each other. There were several instances where moderator Chris Matthews went down the line and took brief (one sentence or even one word) answers. Background: The presence of Ronald Reagan loomed large here. Not only was the debate held at his library, but Mrs. Reagan was sitting, alongside Gov. Arnold Schwarzenegger, in the front row. -This first debate served to put all the candidates--frontrunners and the lesser known candidates--on an equal footing. The frontrunners, Giuliani, McCain and Romney, were interspersed among the lesser known candidates. -Looking at total speaking time, National Journal's The Hotline found that Romney led with 10 min. 47 sec. (19 questions) while Hunter came in last at 5 min. 53 sec. (12 questions). Second in total time and questions (17 questions) was Guiliani at 8 min. 19 sec., more than 2 minutes less than Romney. McCain fielded 16 questions but only spoke a total of 6 min. 7 sec..
-The different questioners and types of questions (questions from Matthews or Harris, from viewers via VanderHei, short answer questions) kept the debate moving briskly and it covered a lot of ground. However, with ten candidates and 60 or 30 seconds to respond it would have been difficult to achieve nuance, as Matthews sought to do at one point. -There was considerable critical comment afterwards in conservative circles about this debate and about whether the GOP candidates should have even participated in a debate sponsored by MSNBC and moderated by Chris Matthews. (Democrats after all have backed away from holding debates sponsored by FOX News). A number of the questions asked did not go over well. For example, "Would it be good for America to have Bill Clinton living back in the White House?" or "What do you dislike most about America?" There were also questions on Karl Rove and a pardon for Scooter Libby. -Despite the criticism, this debate did produce a number of memorable moments including Giuliani's unclear responses to several questions about abortion, McCain's overheated remark that he would pursue Osama bin-Laden "to the gates of Hell," and a question about whether the candidates believed in evolution.